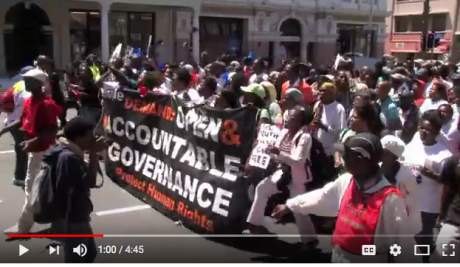 Screenshot: Right2Know marches to the South African Parliament, October 2011.YouTube.South Africa’s new president, Cyril Ramaphosa, has a great deal of work to do to fix the country’s state spy agencies. The most broken agencies are the Crime Intelligence Division of the South African Police Service (Saps) and the State Security Agency (SSA). At best, these agencies failed to prevent state capture by corrupt elements linked to former president Jacob Zuma, and at worst, they enabled state capture. But what if Ramaphosa doesn’t take drastic actions to fix these agencies? Then we’ll have to rely on activists to push for the necessary changes. But what types of activism work and what doesn’t in relation to state surveillance? In answering this question, it’s useful to draw some lessons from anti-surveillance activism in countries as diverse as the UK, South Africa and Mauritius. Edward Snowden’s leaks about state spy agency excesses reminded us that no country should be allowed to enjoy over-broad surveillance powers. Governments the world over have abused such powers to move far beyond their stated purposes of fighting crime and terrorism, to spy on trade unionists, activists and other politically inconvenient people. Yet, state spy agencies are so shadowy and powerful that they may appear unassailable. Yet, state spy agencies are so shadowy and powerful that they may appear unassailable. We should be particularly concerned if the major global surveillance powers give themselves more powers than they should, because their spying activities are likely to extend far beyond their borders. In view of these dangers, it should concern everyone that in the dying days of 2016, the UK Parliament passed the Investigatory Powers Bill into law. This it did despite significant opposition from digital rights and privacy groups. Why were campaigns against the Bill largely unsuccessful? According to research conducted by academics at Cardiff University, campaigns against the Bill relied too heavily on specialist lobbying and advocacy, and not enough on broader public awareness-raising and mobilisation. Anti-surveillance advocates failed to engage social justice movements in the campaign, and consequently they felt alienated from it. In spite of the fact that many activists were at risk of surveillance, organised responses to the Bill were left to expert communities. With the exception of The Guardian, the mainstream press was largely pro-surveillance, as they were dominated by the voices of politicians. The public became resigned to security discourses as terrorist threats were real and present. As a result, there was no significant mass opposition. Yet, a mere six years earlier, UK privacy campaigners had stopped the government’s plans to introduce a ‘smart’ ID card system. The media (including the right wing press) questioned official claims about the contributions of ID cards to fighting terrorism. The public were cynical about the system and feared misuse of their personal information. Anti-surveillance campaigns that are driven by specialists, and that eschew, or do not pay sufficient attention to, building effective mass opposition, will be doomed to fail. Anti-surveillance activists need to take movement-building seriously, and a precondition of such work is public awareness-raising. After all, governments with vested interests in the continued viability of the surveillance industry (such as the UK’s) are unlikely to be persuaded to adopt different positions purely on the basis of good arguments. There needs to be social power behind these arguments, too, and social power implies collective action. The forces of reaction are growing stronger by the day in the very countries that lie at the heart of the surveillance industry. If government over-securitisation is going to be challenged effectively, then anti-surveillance and pro-privacy campaigners clearly need to ‘do’ their work differently. The forces of reaction are growing stronger by the day in the very countries that lie at the heart of the surveillance industry. This needs to start with mapping those social forces and their organisations that are making progressive socio-economic and democratic claims, and placing them at the centre of anti-surveillance work. But what collective actions are needed to reign in unaccountable surveillance, and which are the social forces that are most likely to be most effective? In conditions of neoliberal precarity where the industrial working class has declined in power, it is less easy but not impossible to identify the most likely motors of potentially emancipatory social change, including around surveillance. Neoliberalism has sharpened inequality, leading to the number of marginalised populations increasing: these include the unemployed, those in insecure work and others in the ‘precariat’, youths (especially urban youths), black people, Muslims, lesbian, gay and transgender people. These are the very ‘problem populations’ that are the likely targets of surveillance, which can be used to make them more visible to the state. As a result, they clearly have an interest in resisting unaccountable surveillance. The anti-austerity movements that developed in response to the 2008 global recession, have an immediate interest in anti-surveillance work, too. But in order to make anti-surveillance work relevant to these movements, then it is necessary to find ways of ‘mainstreaming’ this work in the everyday campaigns that bring ordinary people into organised social and political work. Of necessity, working class communities are often highly organised. So, with some creative campaigning, it should not be difficult to relate surveillance and its dangers to mobilisations in defence of public services, for jobs and free education for young people and against climate change. The important part of mass-based anti-surveillance campaigning is to relate the work to existing struggles on the ground. These campaigns need to concentrate on the roles of surveillance in the creation and reproduction of inequality, as it is this conflict that is driving the massive expansion of the global security apparatuses, industries and discourses. If resistance to this expansion is going to be effective, then it needs to provide a political voice to the otherwise voiceless, which means articulating an understanding of privacy that makes most sense to these social groups. This means that the campaigns will need to focus less on privacy as an individual right, and more on its content an enabler of collective rights. So, if privacy is denied these actors, then this will prevent collective discussion and organisation. The problem with understanding privacy as ‘the right to be left alone’, is that when it is pitched against other collective rights, like national security, then inevitably privacy will have to give way. Single-issue campaigns such as the one mounted against the Investigatory Powers Bill allow campaigners to focus consistently on a technically complex issue. But this strength can also be a weakness, in that wily governments are more than able to marginalise these campaigns if they do not enjoy significant social power. One option of drawing on the strengths of single-issue campaigns, while limiting their weaknesses, is to adopt a ‘movement-of-movements’ approach, where coalitions are formed between mass movements and Non-governmental Organisations (NGOs) on specific issues. For these campaign coalitions to be successful, though, they would need to accept the realities of working-class leadership, and consciously steer away from NGO dominance. Rather, NGOs should play a supporting role, providing technical expertise to the campaign without dominating it. NGOs should play a supporting role, providing technical expertise to the campaign without dominating it. Campaigns involving coalitions of movements and NGOs working on issues of mutual interest are fraught with difficulties, especially if they are cross-class in nature; but if handled with maturity, they can achieve significant results. It hasn’t been difficult to build a popular basis for anti-surveillance work in South Africa. The country faces no major national security threats. As a result, governments cannot use terrorism as a beating stick to ensure public acquiescence to overbroad security and surveillance powers. Many older activists experienced surveillance abuses under apartheid, and know how to mount effective campaigns. Surveillance abuses, and broader abuses of the concept of national security to justify massive repression are still part of their lived experiences. 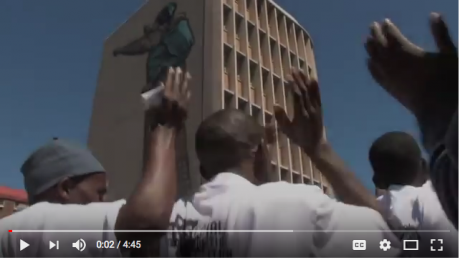 Screenshot: Right2Know marches to the South African Parliament, October 2011.YouTube.These factors made the onset of ‘surveillance realism’ less likely in the country, and created the basis for intergenerational learning about state surveillance and its dangers. South African activists put these learnings to use in a campaign against a Protection of State Information Bill, which the State Security Ministry wished to use to throw a shroud of secrecy over the country’s security apparatus. Parliament passed an amended version of the Bill in 2013, after a huge public campaign against it. Tellingly, the Bill languished unsigned on the desk of scandal-ridden former president Zuma. Not even he was willing to risk the public backlash of signing it into law, which means that Ramaphosa sits with the headache. Now, the South African government goes out of its way to consult on potentially controversial Bills. While discussing one such Bill with activists, one senior politician even said ‘please don’t give us another Secrecy Bill campaign’. The tiny island nation of Mauritius, off the coast of south east Africa, also offers some interesting lessons. Mauritius has a highly organised working class, largely owing to militant trade unionism on the sugar plantations. In 2013, the Mauritian government introduced a ‘smart’ ID card system, similar to the one the UK government envisaged before it abandoned its plans. It argued that the card would help the government stamp out identity fraud and theft. While on the surface of things, this initiative sounded laudable, Mauritians rose up and opposed the ID card through several campaigns, claiming that it threatened privacy and even democracy itself. The government’s plans were particularly draconian, though, as they required residents to carry their identity cards at all times, on pain of a fine or even imprisonment if they didn’t. This lived experiences of population registration being abused for social control purpose has been passed down through the generations. What gave the Mauritian campaigns such traction was the country’s history of colonialism, slavery and indentured labour. Indentured labourers were required to carry identity cards at all times, which created widespread resentment against mandatory identification systems. This lived experiences of population registration being abused for social control purpose has been passed down through the generations. The campaigns formulated several demands, including that the government should destroy the biometric database and stop the ID card from being mandatory. A popular campaign slogan, ‘It’s part of you’, conscientised citizens about their right to exercise control over their biometrics, as this data was tied intimately to their personhood. Campaigners relied on national radio, posters and leaflets to spread the message. They also used village councils to conduct public education on the dangers of the system, although many of these councils ended up complying with the government. In the campaign, activists made links between workers’ rights and the state’s surveillance efforts, including through the ID card system. In the process, they turned what could otherwise have been an issue dominated by the technical part of society into a mass issue that focused on the repressive framework that underpinned the system. In other words, they politicised the issue. Activists also engaged in direct action and passive resistance, organising ‘go-slows’ at the ID conversion centres and blocking queues by refusing to enrol their fingerprints. These efforts fostered a popular consciousness about the dangers of biometric technologies. Anti-surveillance actions spread beyond the ID card as people developed confidence in their abilities to struggle. Workers began to refuse to provide fingerprints for registration purposes at their workplaces, and started criticising cameras on buses as violations of their privacy. In spite of the government’s gains in coercing many citizens to enrol, the campaigns could not be ignored, especially by those in the Parliamentary opposition. Senior members of the opposition were brought over to the side of the campaigners, and supported their objectives. Campaigners used the courts, too; but significantly their recourse to the law was but one of several tactics used. This was because activists recognised that they were unlikely to win their demands in the courts if they had not won them on the streets first, as court actions on their own were unlikely to change the balance of social forces. Prominent Mauritians brought court cases against the system on constitutional grounds (such as the right to privacy), including the ex-Vice Prime Minister and ex-Minister of Justice. Eventually, the government destroyed the centralised biometric database, and converted the biometric system from a one-to-many system (requiring the verification of a person within an entire population) to a one-to-one system, where a person’s identity was confirmed through a comparison of their biometric data with previously enrolled data. However, the government continued with the mandatory enrolment of citizens and the requirement to present proof of identity to the police on demand, which meant that in spite of this limited victory, the campaign continued. What do we learn from these campaigns? A political understanding of the problem of surveillance, that moves beyond a rights-based approach, and recognises the root of the problem ­– which according to Henry Giroux is the growth in the exercise of arbitrary state power as neoliberalism intensifies – is more likely to be both effective and sustainable. What is key, though, is an approach to anti-surveillance work that builds the capacity of mass movements to take on campaigns themselves, rather than outsourcing the struggle to specialist NGOs. In fact, NGO employees need to make conscious efforts to work their way out of their jobs. Once these campaign strategies are incorporated into anti-surveillance work, then activists may start to enjoy some truly significant victories over these most secretive and intractable areas of state and commercial power. An earlier version of this piece appeared in the Daily Maverick on March 13, 2018.